Watch the video of my testing of 3 stepper motors for the home-made CNC machine. This test was CRUCIAL and could be the most important test that I have done for this project. After having successfully tested the breakout board interface to the computer program with one stepper motor, my next move was to test three stepper motors. This was what a normal cnc machine was expected to do. I just had to install two more stepper motor driver boards with their corresponding motors and connect them to my breakout board. This time it should not be too difficult as all the layout had already been planned. I used the same 12 volt power supply, although the current rating might not be high enough. I took the chance, hoping that it would not draw that much of a current. If needed, I planned to stop if it gets too hot. Panasonic dot matrix printer with cover opened. The power supply and the control card are visible. I had two stepper motors available. But how about the third one? I decided to use one from an old dot matrix printer that I bought some time back. According to the specifications for the driver board, the voltage rating of the motor is not so very important as it works by sending chopper pulses to drive it. 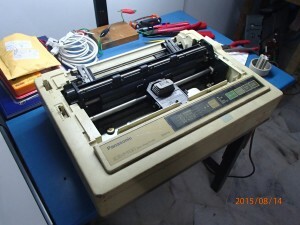 Panasonic dot matrix printer with the print carriage removed. The power supply and the control card were visible. The Linux CNC program needed some tweaking in the settings in order to accommodate all the motors. This was especially so for the one which was already installed at the printer carriage driving gears, timing belt and a movable linear object like a printer head. And I had to be careful to set the movement limits so that it would not crash and damage the assembly. During the testing, since nothing about limits, sizes, speed, emergency stop, and homing setting was definite, I was on the alert to switch off the power to the driver boards anytime I suspected it would crash on the surroundings. To add to the difficulty, I was also not so well versed in the operation of the computer program. Dismantling the panasonic dot matrix printer did not pose much of a problem. I just had to study the equipment and find out which were the screws that needed to be removed in order to dismantle it logically. First out comes the plastic cover. The cover came with push button switches which were linked to an electronic control board and the power supply unit. The wiring were easily removed as they were all plugged in with electrical pin connectors. 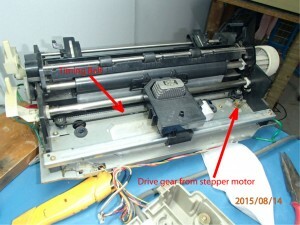 There were two stepper motors: one a bipolar, which drives the print head and another a unipolar which drives the paper roller feed. I was not able to use the unipolar motor at this time. I did not bother to check the print head itself. 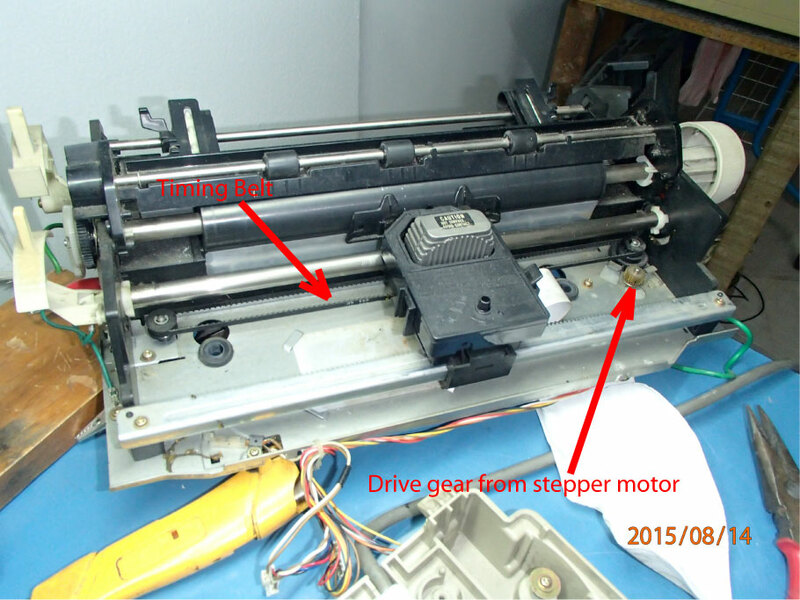 I suspected there should be an actuator device to move the indentation mechanism for the ink ribbon and an actuator to move the ribbon around so that it would not be in the same position all the time. 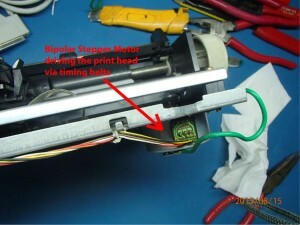 Each bipolar stepper motor was connected to its own driver card. I had to make sure that the solder joints were strong. This was very important. I had seen many warnings everywhere that driver boards can get burnt and damaged if the motors were not connected when they were powered. I did not want to take any chances. I opted for solder joints instead of using screw connectors or push pin joints in order to avoid loose joints. 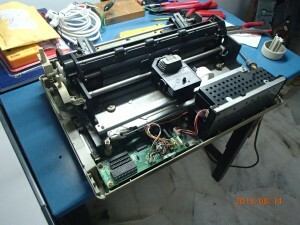 The second step in dismantling the printer was to separate the printer carriage from the printer plastic housing. 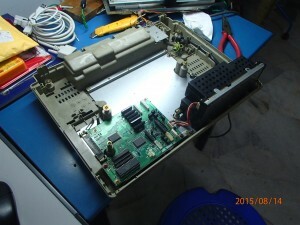 The printer control board and its power supply was also not needed. 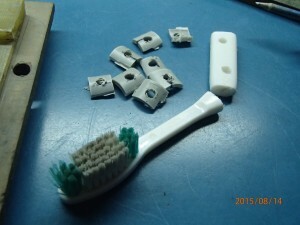 Even the roller assembly was not needed, but I left it in place because it would not be interfering with my test. If my test was successful, I would consider dismantling only those items that I could use to fabricate my cnc machine. That would be another task. Right now, this was THE most crucial test to be done. Only if all the controls were tested to work can I start to plan for fabrication of the mechanical parts. It makes sense doesn’t it. Any sliding, rotary or mechanical movements however well made will not be of any use without the controls which drives the movement. Well, from the test, I am happy to say that I have passed the crucial test! My next step will be to source for and procure all the mechanical parts, work out the details on design dimensions, layout, finding materials, fabricate, maybe improvising on making components, doing research, and much more activities. There are still many things to do, but the process is fun. I did not set any target date for completion as the journey itself, being a learning experience, is certainly worth it.